Someone Bought This: Finally! The Gobbledy Gooker is on a t-shirt! - WrestleCrap - The Very Worst of Pro Wrestling! At long last, a shirt dedicated to the Gobbledy Gooker is here! I love how the site’s description of the character; even WWE knows they screwed up with this one. Said description also mentioned the possibility of the world’s 1st grappling dinosaur initially being a possibility of being in that egg….I think I’m a little sad now that we never got that….DAMN YOU GOOKER! BUT DAMN FINE SHIRT! Sean was just one of about 6 Crappers to email me about this ugly, stupid shirt with the fake Gooker on it! Don’t try too fool us WWE, we know the difference! In the autumn of 1990, World Wrestling Entertainment literally laid an egg. In the weeks leading up to that year’s Survivor Series, a giant shell began appearing at WWE events all across the country. What was inside this prehistoric-sized egg was a complete mystery to everyone in the WWE Universe, but speculation still ran rampant. Was it a famous World Champion waiting to make his WWE debut? Could it be the first grappling dinosaur in sports-entertainment history? All these questions were answered at Survivor Series on Nov. 22 when the egg finally cracked. With the trustworthy “Mean” Gene Okerlund standing by, the shell broken open and one of the most disappointing personas in WWE history made its first appearance. Known as The Gobbledy Gooker, this 6-foot turkey was greeted by a chorus of boos from the disappointed crowd of 16,000 fans in the Hartford Civic Center. Instead of a returning Superstar or a beautiful woman, the fans got a walking Thanksgiving dinner. Thanks to everyone who sent this in, and I hope you Crappers have a wonderful Thanksgiving! They made a Mega-Maniacs shirt?! WWF Merchandise Catalog scan courtesy of @WWFMagArchive on Twitter. 8 Responses to "Someone Bought This: Finally! 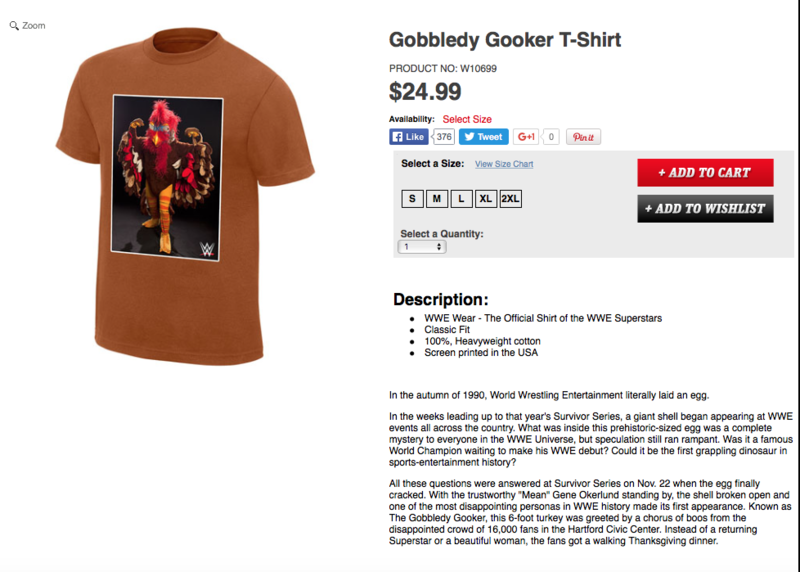 The Gobbledy Gooker is on a t-shirt!" The last few years that The Hulkster was in action could qualify as a dinosaur wrestling. It needs to be one of those light reflector shirts, where one angle is the egg with the Gooker, and the other is the bird himself. Imagine if the Gooker was Kevin Sullivan, and it was Brian Pillman instead of Mean Gene. I RESPECT YOU, GOOKER MAN!! That’s just the Gooker in a Gooker mask…DON’T BE FOOLED!